Designed by pilots for pilots, our high-quality iPad Rotating Kneeboard is covered with soft, leatherlike material and features a wide hook-and-loop leg strap to hold the kneeboard in place during flight. 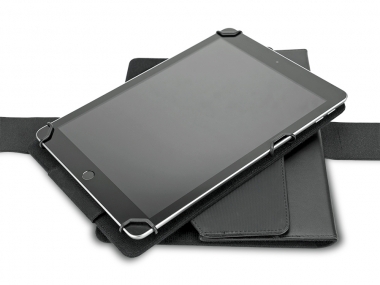 Inside, the rotating iPad frame holds the device securely and allows for 360-degree rotation of the iPad. An easel is built into the kneeboard for adjustable tilted viewing, in and out of the cockpit. The power port is accessible with the cover closed, a window exposes the camera lens for easy picture taking, and a small elastic loop securely holds a pencil, pen or stylus. Functional - Elastic strap makes for a secure fit in the cockpit; sturdy clips hold device in place. Versatile - Rotates 360 degrees to provide both profile and landscape options. Variable tilt feature allows for flat or pitched positioning in the cockpit or on the desktop. Multitasking Binder and Kneeboard - Window for camera. Elastic loop securely holds a pencil, pen or stylus. Strap kneeboard to your leg in profile or landscape position. Fits iPad 9.7" models. Measures: W 7" (closed) x H 10" x D 1"; W 14-3/4" (opened).